The Global Advances Group was invited to be part of strategic panel of advisers at the International Forum on Ethnic Rights and Social Development in Post-Conflict Societies: The Role of the National Police, Private Companies and International Institutions, in Bogota, Colombia. The Forum was designed by ECODESARROLLO from its strategic alliance with the International Training Centre for Human Rights and Peace (EIP-CIFEDHOP), whose headquarters are in Geneva (Switzerland) and has a presence in forty countries. The EIP has consultative status to the UN system and is known for its international work in training civil servants in post-conflict societies. The Forum focuses on human rights and development opportunities, highlighting the crucial role played by the National Police in post-conflict situations. International experts from the United States, Canada and Switzerland, will discuss these issues along with members of the National Police and the private sector. The Forum will be held at the National Police Auditorium on Sept. 29, 2014 and will include government officials, international agencies, diplomats, researchers and media. 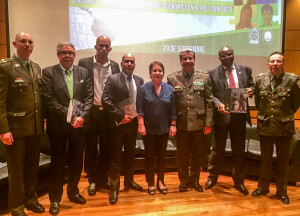 The aim of the Forum is to find options to strengthen the role of the National Police, discuss concrete opportunities for the advancement of ethnic groups and present, with the support of international associations and organizations, a national strategy for ethnic development in the complex context of a post-conflict environment that will determine the future of the Republic of Colombia. The Global Advances Group is committed to allocating resources for business endeavors that demonstrate both profitability and a positive social impact. We acknowledge that purpose and profit are not zero-sum – they are mutually reinforcing and require the determination to take necessary risks. Our strategy consists of creating revenue streams to support projects that provide a positive social impact and ultimately benefit the whole of humanity. Copyright © 2006-2019 - Global Advances Group, all rights reserved.